Crews from the Forestry Division have been busy with the planting of over 200 parkway trees this week. Many of this year’s plantings replaced trees that were removed due to storm damage. A combination of 27 different speicies will be planted as part of the Fall program. There are 113 plantings to replace trees damaged by storms over the summer and 132 of the plantings will be the specific trees requested by residents. The long-term planting goal is to form an enclosed street corridor by increasing the tree quantity and the amount of tree canopy foliage that occupies the space along the public streets. With an active planting program since the early 1970s, more than 54% of the current parkway trees have been planted between 1970 and the present. 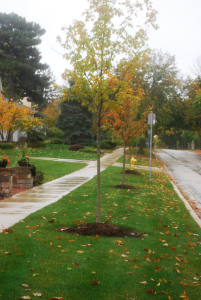 Parkway trees are planted to replace a tree that was removed, to fill in parkways of new subdivisions, or in response to a resident's request for a new tree planting where there is no tree. Resident requests for specific tree species are honored when possible. Contact the Village at 630.434.5500 for more information on tree requests for the spring 2012 program.